Atari Flashback Blast! Basically a HDMI dongle that has the games with a wireless controller. Seems cool. But some seem better than others. Having different amounts of games seem kind of weird on each and they are the same price. Anyone else seen these yet? I've read about these but I've not seen them at stores yet. 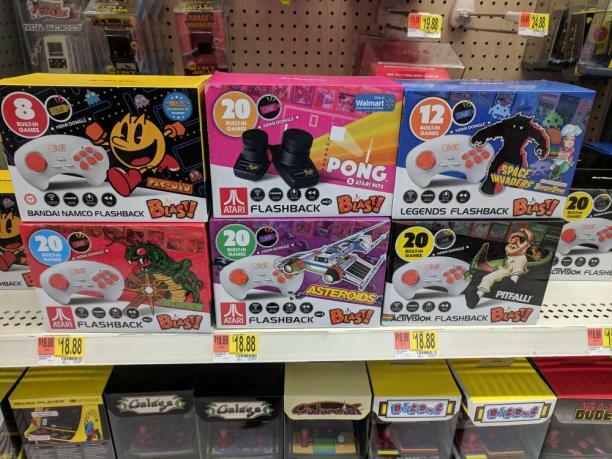 I think these (well, at least the pac man one) are buyer beware. This video suggests avoiding the Walmart-exclusive versions. AtGames seems to churn out shoddy cheap barely good enough product that casual people keep buying due to nostalgia goggles and that is fine, it certainly is a market that seems to do well for them but their Sega emulation for example has horrid audio quality I have seen too many video and comments in forums etc, that indicate they have no real love for the classic gaming community, they simply wish to make money off it and maximize profit by using the cheapest emulation and hardware they can. In other words it is junk. There are already dozens of ways to get the same experiences of classic games either free or cheap using better or existing platforms / devices most of us already have. They always seem to rush out product. I have both the Colecovision and Intellivision Flashback systems by AtGames. Initially they had planned the included controllers to be compatible with the original systems, they are NOT. In the end they rushed them out saying perhaps in the next version which has yet to happen. Those controllers can be adapted or modded but really they should have just waited and made them compatible right out of the box as that would have added a lot more value to the Flashbacks even if it had meant adding $10 to the final cost. Also, the emulation was not the greatest, the Intellivision one seemed passable but the Colecovision though mostly passable games like MICROVISION THE HEIST literally run at about 1/2 speed making it play and sound horrid. I am not excited about these. 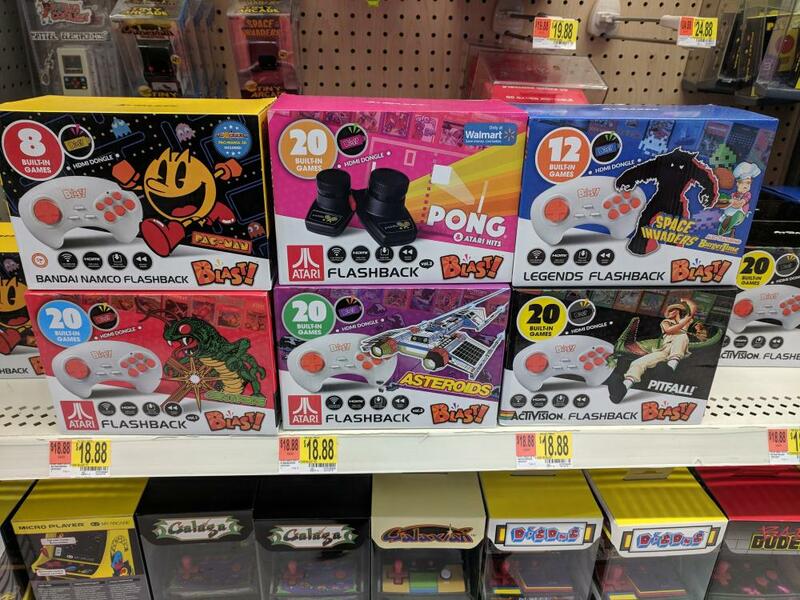 For the Atari stuff, it seems they are just dividing up some of the Flashback games it to smaller, cheaper selections. Well, they are blocking people on Twitter for anyone questioning or criticizing. The big update on these is the HDMI output. Worth it? Maybe...if the price is right. I didn't realize these were made by ATGames. That's pretty much a deal breaker for me. Guess I'll just stick to my modded NES classic for playing Atari games in HD. They were $18.88 at Walmart. Thought it was weird some units had more games as others. I may get the paddle one since there are not many modern alternatives to play those games with a proper paddle controller. The rest I can leave. I use my NES Classic for everything else that requires HDMI. I am curious about the 1UP style full size arcade cab with 400 games. The optimist in me sees great possibilities but realistically it'll probably be a train wreck. Ya, I'm not into these especially after seeing some stuff about them. Another cool idea not executed well at all!!!! I won one of these from AtGames the day after Christmas! I thought the batteries in the handheld would be sufficient enough to power the unit completely. But to plug in the dongle with an AC adapter behind the TV makes it difficult to use on a regular basis. Maybe if they make the dongle rechargeable?? I ended up selecting the Activision Blast unit. I love the rewind feature!